Bring home the party with this compact one-box high power audio system. 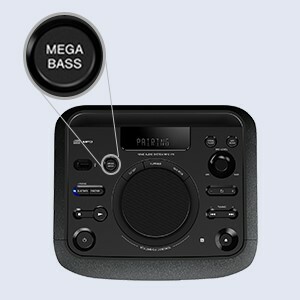 Enjoy powerful sound from a space-saving all-in-one design and give low frequencies a boost with mega bass. You can experiment with DJ effects, invite your friends over for karaoke and go head-to-head. Easily connect systems with party chain to build the ultimate in party sound. Pick it up and party anywhere! 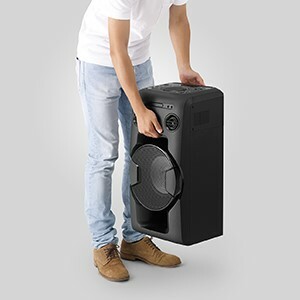 whether you’re hanging out with friends at home or taking the party elsewhere the compact design make it easier to move. Its easy to handle and takes lesser space than similar products. 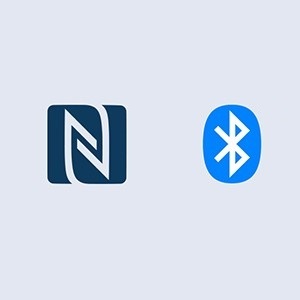 Near field communication (NFC) and bluetooth technology remove the need for wired connections and complex set-up sequences. Simply touch your NFC-enabled device to the V11 for a quick, seamless connection and start streaming your music collection. No NFC? No problem. Connect via bluetooth technology and you’re ready to go. 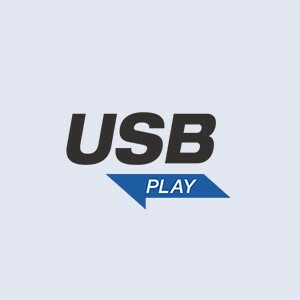 Use the USB port to quickly connect your digital music libraries and keep the party moving with your favourite playlists. And to make sure you don’t run out of battery, the USB port even charges your phone. Produces detailed sound, clear vocals with thumping bass effect with help of 2 cone type tweeters and a subwoofer. 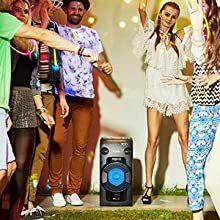 Hit the mega bass button on the panel to add more powerful bass to the music and enjoy thundering low frequencies that flow right through you. 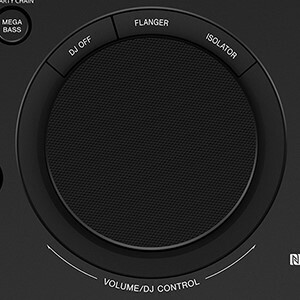 Press isolater/flanger buttons on control panel to perform DJ effects. Rotate the dial knob to perform DJ effects. LDAC is a new audio technology from Sony that allows you to enjoy the highest quality wireless audio via bluetooth. It sends approximately three times more data (at the maximum 990 kbps transfer rate) than conventional bluetooth audio. 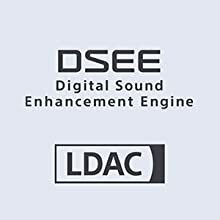 While DSEE sound enhancement adds rich detail for high quality sound in every track. Karaoke competitions with your friends are easy. Just pop in a CD, USB or sing along to songs from YouTube via bluetooth. 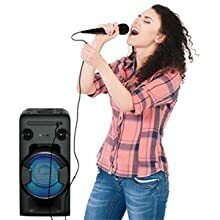 Two mic inputs let you team up with friends for the sing-off. A built-in vocal fader function even turns down the voice on CDs so you can sing all your favourite songs. 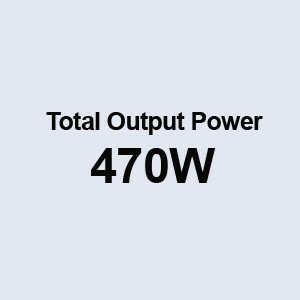 Add extra power to your sound system. 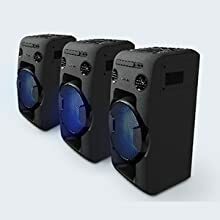 Connect multiple stereos in a chain for a high sound output. Activate one device to be the party host and sync music with the other systems in the chain.